View of the tomb in Dakhla Oasis. 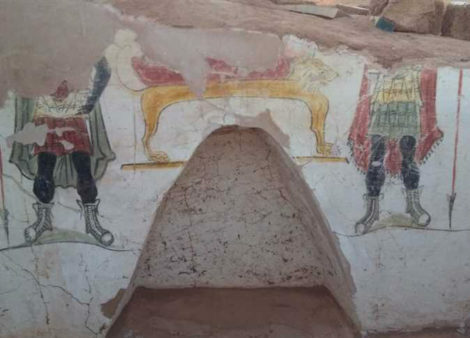 The Egyptian archaeological mission from the Ministry of Antiquities at Ber El-Shaghala archaeological site in Mout village at Dakhla Oasis uncovered two tombs dating to the Roman period. The walls of the tombs are painted with religious scenes. The excavation was carried out along the eastern side of the site. The first tomb is built of sandstone and has a 20-step staircase that leads to its entrance. Its main hall extends from east to west. It is made of mud brick. Its northern wall has entrances leading to two burial chambers containing human skeletons, clay lamps and pottery vessels. said that the second tomb has a funerary corridor that leads to a vaulted chamber on its northern wall, which holds a niche engraved with a painted scene depicting the mummification process. Dr. Ashmawi pointed out that more than 10 other incomplete sandstone tombs from the Greek era were uncovered in the area.